The 47 Eastbay has been treated exceptionally well on the resale market because she is just a great boat. She has a lovely profile, great performance and the spaces just "flow." Abundant storage for cruising and yet easily handled for lighter day use. She is handsome in any harbor and while large enough to take on any sea state she is sized moderately enough to slip into even the most quaint of coves. Ask any long time Grand Banks professional employee which is their favorite boat GB ever built and an overwhelming majority will vote strongly for the Eastbay 47. She is just a great boat. This particular example is exceptional. She was owned since new by an experienced, discerning, and fastidious owner. She has received constant upgrades to her systems. New Garmin GPS at both helm stations and fresh Alexseal hull are just examples of her care. She also has a factory hard top with a polished stainless steel structure and overhead hatches. All the best options, the right layout and top of the line condition...this is a special 47 Flybridge. She is not available to close until after the July 4th weekend. United Yacht Sales New Jersey would love to guide you through a personal showing of this 47' Grand Banks Eastbay 47 Flybridge 2006. 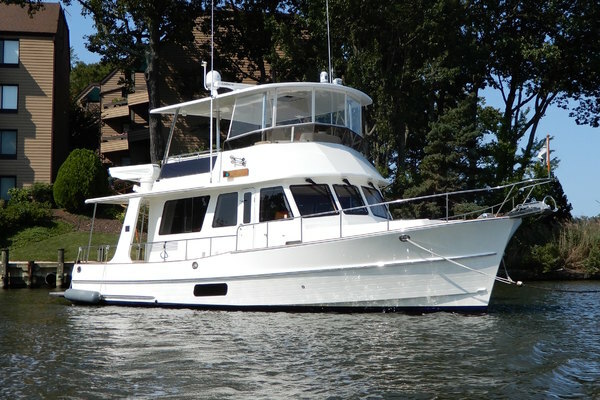 This yacht for sale is located in Annapolis, Maryland and priced at $679,500. For a showing please contact us by filling out the form on this page and we will get back to you shortly! Call for more information, this boat has just been listed, but she will not last long. Tremendously well maintained and in BRISTOL condition with many recent upgrades. Please note that she is not available for delivery until after the July 4th weekend.